Research led by two Indiana University School of Medicine faculty members has culminated in U.S. Food and Drug Administration approval of a new drug for patients with an uncommon, painful and deforming bone disease. The drug, burosumab, treats X-linked hypophosphatemia, or XLH. It is being brought to market by Ultragenyx Pharmaceutical Inc. in collaboration with Kyowa Hakko Kirin Co., Ltd. and its European subsidiary, Kyowa Kirin International PLC, under the brand name Crysvita. XLH is a phosphate-wasting disease that causes rickets and osteomalacia, or softening of the bones. It is typically inherited and affects more than 12,000 patients in the United States and one out of every 20,000 people worldwide. Patients are typically diagnosed as children and have bowed legs, short stature, and experience bone pain and dental abscesses. 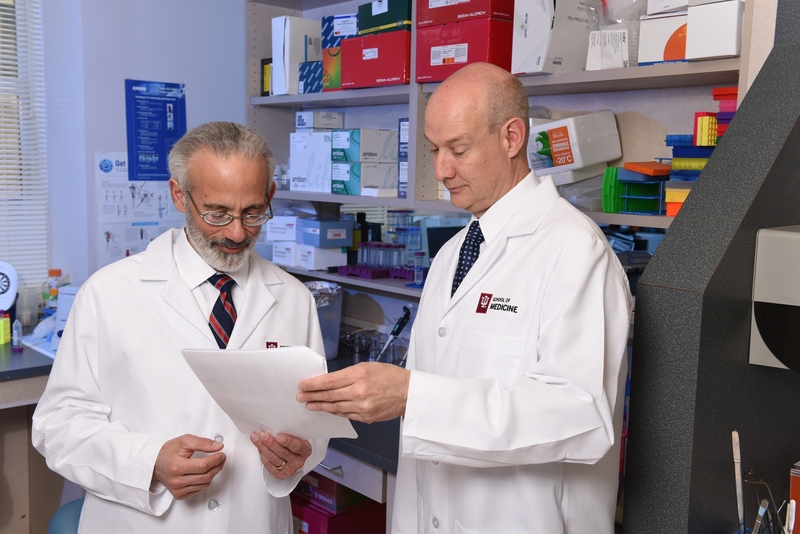 The new treatment is based on patented discoveries made by Michael Econs, MD, chief of the Division of Endocrinology and Metabolism at IU School of Medicine, and Kenneth E. White, PhD, the school’s David D. Weaver Professor of Genetics. Econs and White were the first to publish work in the journal Nature Geneticsthat mutations in the hormone Fibroblast growth factor-23 (FGF23) could lead to certain genetic forms of hypophosphatemic rickets. “The most important thing to us as parents is the welfare of our children, and having a discovery that lays the foundation for an effective treatment of an often severe and difficult-to-treat childhood disease is incredibly fulfilling,” added White, a Chancellor’s Professor. Econs began treating patients with XLH in 1986 as a fellow at Duke University and soon began a 30-year quest to develop new therapies for patients. In 1995, he was part of a team that discovered that XLH is caused by a mutation in the PHEX gene. Econs and White later played a role in determining that the “genetic typos” in PHEX somehow signaled the body to make too much FGF23. High levels of FGF23 cause the body to excrete excessive amounts of phosphate in the urine. Phosphate is a mineral critical for proper bone formation in children and bone strength in adults. Without enough blood phosphate, patients develop rickets and other debilitating symptoms of XLH. The Indiana University Innovation and Commercialization Office licensed their patents based on the discovery to Tokyo-based Kyowa Hakko Kirin. Kyowa Hakko Kirin produced burosumab and subsequently entered into a collaboration and license agreement with Ultragenyx Pharmaceutical of Novato, California, to collaborate in the development and commercialization of burosumab. Clinical trials, led in part by Erik A. Imel, MD, an associate professor of medicine and pediatrics at IU School of Medicine, Munro Peacock, MD, DSC, a professor of medicine at IU, and Dr. Thomas Carpenter of the Yale School of Medicine, have demonstrated that burosumab normalizes blood phosphate thereby improving rickets and lower-limb deformity of the legs in children, and bone healing, fracture resolution, and osteomalacia in adults. The drug received approval from the European Medicines Agency in February for use in children and adolescents with XLH. The FDA approved usage for children one year of age and older and adults with XLH in the United States on April 17. It is the first treatment that targets the underlying cause of the disease. Econs and White’s research related to XLH and other related diseases has been funded by multiple grants from the National Institute of Arthritis, Musculoskeletal and Skin Diseases and the National Institute of Diabetes and Digestive and Kidney Diseases, parts of the National Institutes of Health. In addition, Econs has received continuous philanthropic support from the Scottish Rite of Indianapolis Foundation since joining the IU School of Medicine faculty in 1997. In addition to funders, Econs and White acknowledged their important scientific collaborators, and they thanked the many patients who participated in their research.